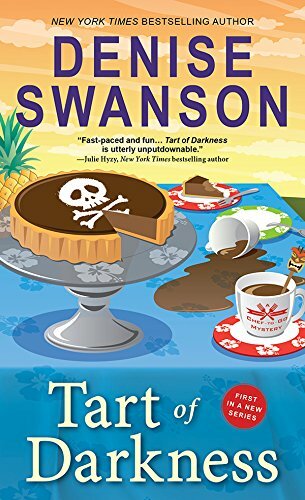 The characters and romances are better than the mystery in Tart of Darkness. Dani Sloan inherits a Victorian half-finished bed and breakfast. A former Human Resources executive, Dani really wants to be a chef. She decides to share her house with three college students: Ivy, Tippi and Starr. In return for reduced rent, all three promise to help Dani launch her new business, Chef-to-go. The business offers catering, personal chef and lunch drive-thru service from her kitchen window. When Dani is asked to cater queen bee Regina’s luau, she thinks it may be her ticket to more business from the area’s wealthy customer base. Instead both Dani and Ivy are suspected of murder. Ivy’s uncle Spencer is head of campus security. He and Dani decide to solve the case by looking into who had motive and opportunity. Bliss, Regina’s best friend, Laz, Regina’s boyfriend, and Vance, Regina’s ex and Bliss’ current boyfriend are all suspects. I liked the interaction of Dani and Spencer better than the mystery within Tart of Darkness. The mystery threw a lot of information in the last few pages that was needed to solve the crime making it difficult for armchair detectives to solve. All of Dani’s meals sound delicious but where are the recipes? I will read the next in the series to see where Dani’s romance leads rather than expect a captivating mystery. 3 1/2 stars. Thanks to the publisher, Sourcebooks Landmark, and NetGalley for an advanced copy. There is a giveaway for this book here through April 27, 2018.